By reader request, today's astro-political microscope features outspoken Texas Democratic congresswoman Sheila Jackson Lee. Lee is a hard-authoritarian Leftist that Right-wingers and libertarians love to hate. She has made a name for herself by spouting extreme partisanship, outrageous political correctness, disrespect for freedom and privacy, and comical ignorance of the history of the land and people she nevertheless feels competent to govern. Libertarian: Sun quintile Pallas. Pallas quincunx North Node and co-ruled by Pluto which is trine the North Node. Authoritarian: Pallas square Jupiter, square and co-ruled by Pluto, co-ruled by Mars which is conjunct the South Node. The authoritarian factors are stronger. Anti-capitalist: Venus trine Neptune and South Node, and co-ruled by Saturn which is contraparallel Neptune. Venus quincunx Saturn is also a (slight) anti-capitalist factor. Conservative: Inconclusive due to unknown time. The possible Moon quincunx with the North Node might lend a conservative bent... but in combination with an authoritarian Pallas might suggest deep-seated racism. 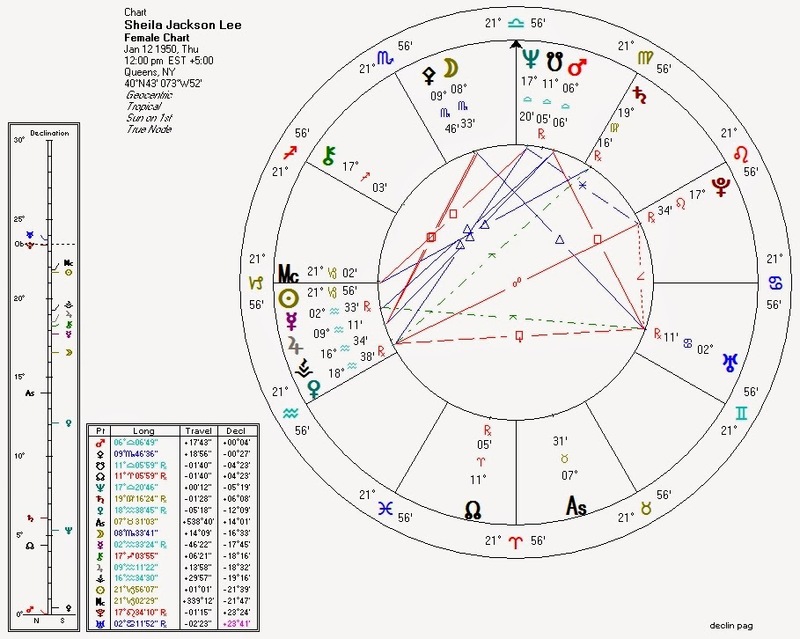 Liberal: Regardless of birth time, the Moon is ruled by Mars (which is conjunct South Node and Neptune) and by Pluto (which is tightly sextile Neptune). This combination of factors is pretty hard to override. Saturn septile Pallas: Saturn/Pallas plus an authoritarian Pallas seems to be the "gun control" signature. Pluto co-rules Moon and is opposite Venus: Pluto with both the Moon and Venus is a common feminist signature. Mercury conjunct Jupiter: big (Jupiter) mouth (Mercury).